So then! As promised over in the Member Intros section, here’s some info about a project I’ve been working on for a little while now. When I obtained my Amiga 500+ (my first ever home computer) back in 1991, I was simultaneously introduced to Amiga Power magazine, and loved it straight away thanks to its mixture of incisive reviews, imaginative features and irreverent humour. I only grew to love it more as the years went on, and ultimately it was AP that inspired me to pursue a career in journalism and publishing. In more recent years I’ve become involved with the Amiga music remix community. I don’t possess any musical skills myself, but about five years ago I started commissioning some of my favourite artists to produce new renditions of various splendid Amiga game tunes that hadn't previously been remixed, and this led to a friend inviting me to work with him on an album project in the role of co-producer. I enjoyed the experience tremendously, and I found myself wanting to produce a similar project of my own – and it quickly occurred to me that an Amiga Power tribute album would be just the ticket. I began working on Amiga Power: The Album With Attitude (a title inspired by AP’s cover tagline, “A Magazine With Attitude”) in late 2017, and it’s just now starting to come to fruition. It’s set to be a double-CD release jam-packed with brand new Amiga game music remixes, all with some special connection to AP; the first disc will contain remixes based on tunes nominated by former AP contributors, and the second will feature remixes inspired by games and demos that appeared on the magazine’s coverdisks over the years. I already have permission from Future Publishing to use the Amiga Power name and logo, most of the old AP team are involved, and we’ve got a whole host of splendid musicians on board, including Andrew Barnabas, Allister Brimble, Mike Clarke, Olof Gustafsson, Jogeir Liljedahl, Jon Hare, Chris Huelsbeck, Barry Leitch, Jason Page, Instant Remedy, Matthias Steinwachs, Jeroen Tel and Tim Wright. In total the album will boast 35 tracks, including remixes from the following games: Apidya; Banshee; Blob; Cannon Fodder; The Chaos Engine; Fantasy World Dizzy; Fire & Ice; Gloom; Harlequin; Hired Guns; Jetstrike; Lotus Turbo Challenge 2; No Second Prize; Pinball Fantasies; Sensible World Of Soccer; Shadow Fighter; Speedball 2; Stardust; and many more. I’m working on the project in association with 010101 Music, an independent record label that specialises in Amiga remix albums, and with additional support from C64Audio.com, and pretty much everything is organised at this point. All we need now is the funding to produce everything, and to this end I’ll be launching a Kickstarter campaign on Friday, March 29th. I’ll soon be able to share more info about the contents of the album, as well as clips from some of the remixes that have already been completed, and there’s now a dedicated AP album group up and running on Facebook, just over here. Also! If you tune into SceneSat Radio this evening between 6pm and 8pm GMT (7pm to 9pm CET), you'll get to hear an AP album exclusive; one of the tracks from the album will be featured in its entirety. Many thanks indeed for reading. More news to come soon! Wow - what an impressive labor of love, two years in the making! Congrats on getting this to the finish line, Matthew. What a fantastic achievement! Can't wait to check it out when you're ready. Do you have a ship date yet? Are you going to have it on band-camp, for digital download (for a charge, of course)? Please keep us updated. Especially when going into the Kickstarter as it might move. Once the KS is out I might advertise at some other sites. intric8 wrote: Wow - what an impressive labor of love, two years in the making! Congrats on getting this to the finish line, Matthew. What a fantastic achievement! Can't wait to check it out when you're ready. Cheers muchly for the kindly comments and support, sir! It's greatly appreciated! My hope is that the album will be ready for final mastering by the middle of this year, and then produced and distributed to all the Kickstarter backers by November, so that we avoid getting caught up in the busyness that always afflicts the postal system in the run-up to Christmas. The terms of the licensing agreement with Future (for the use of the Amiga Power name and logo) mean that I can't sell the album indefinitely, so it likely won't be appearing on Bandcamp in its current form, but I might be able to make the tracks available on the site at a later date, under a different title. Additionally, there will be a digital-only option available via the Kickstarter, so hopefully I've got all bases covered! McTrinsic wrote: Please keep us updated. Especially when going into the Kickstarter as it might move. Secondly, top bloke Amiga Bill of TheGuruMeditation was kind enough to give the album a shout-out in Sunday's edition of his Twitch show REPLAY (from 28:15), which you can view via this link. Hurrah! With less than a week to go before the AP album Kickstarter campaign launches, it's time to share a remix preview with you all, courtesy of the extraordinary Brian Sadler (composer on Harry Partridge's spifftacular Starbarians series). As you'll discover, he's created a frankly fantastic orchestral arrangement of the theme from Banshee, as featured on one of AP's May 1994 coverdisks. Zounds, eh? As the AP album Kickstarter draws closer, here's an extra-special promo treat from the amazing Farook Shamsher of Joi. It's the first of three studio remixes that he and his late brother Haroon created back in 1993 while working on the soundtrack for The Chaos Engine. The third of the tracks – nicknamed the Play With Me Mix – will be available exclusively on the Amiga Power album; and as a special bonus for everybody to enJoi, Farook has fantastically kindly agreed to allow Chaos Engine Remix 1 to be released for free on YouTube and SoundCloud. Hurrah! As you'll discover, the SoundCloud version of the track includes a download link so you can nab a copy of the mp3. Hurrah 2! This compilation is also available on SoundCloud, just over here. 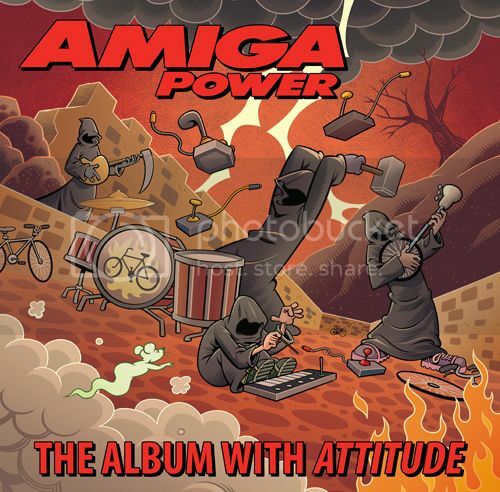 Well, the day has finally arrived – Amiga Power: The Album With Attitude has launched on Kickstarter! You can view the campaign video below (featuring a very silly voiceover from someone or other), and if you'd care to lend your support by making a pledge and/or spreading the word about the project, that would be utterly splendid. The Kickstarter homepage can be accessed via this link. Many thanks, one and all!